After a summer of running and a couple trips to Rocky Mountain National Park, I felt like I was ready to climb Mt. Meeker. I didn't want to climb it alone, but luckily one of our new doctoral students, Elizabeth Schlessman, wanted to climb Meeker, too. Knowing the peak of fall weather was at hand, we set out on a beautiful Saturday to see if we could summit Longs's nearest neighbor. Elizabeth and I hit the trail around 6:30 and steadily moved above the trees and got the classic view of Meeker and Longs. This is really a wonderful place, and getting there was far easier than I remembered it from my climb of Longs in 2000. 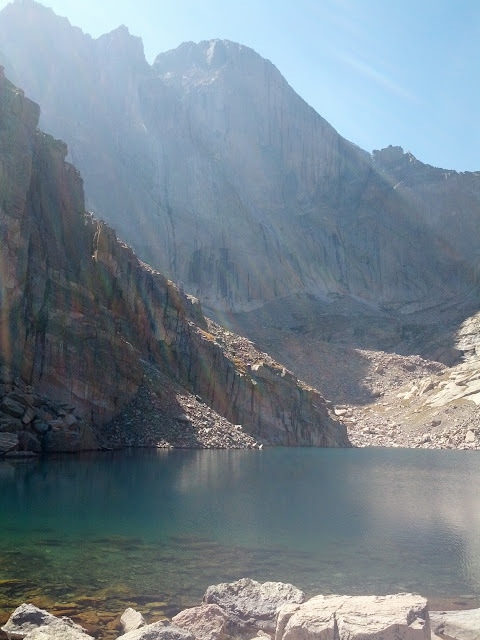 Then again, this time I was in shape, accustomed to the altitude, and not carrying 45 pounds of camping gear. Meeker on the left, Longs on the right, and Ships Prow in the center. Our route (the Loft Route) climbs the gully left of the Prow. I couldn't have imagined better weather for this day. Not too hot, or cool, or windy, and practically no risk of storms. Post-monsoon climbing is great! I think the only non-beautiful sight I saw the whole day was the smog layer over the Front Range. It was good to be above it. 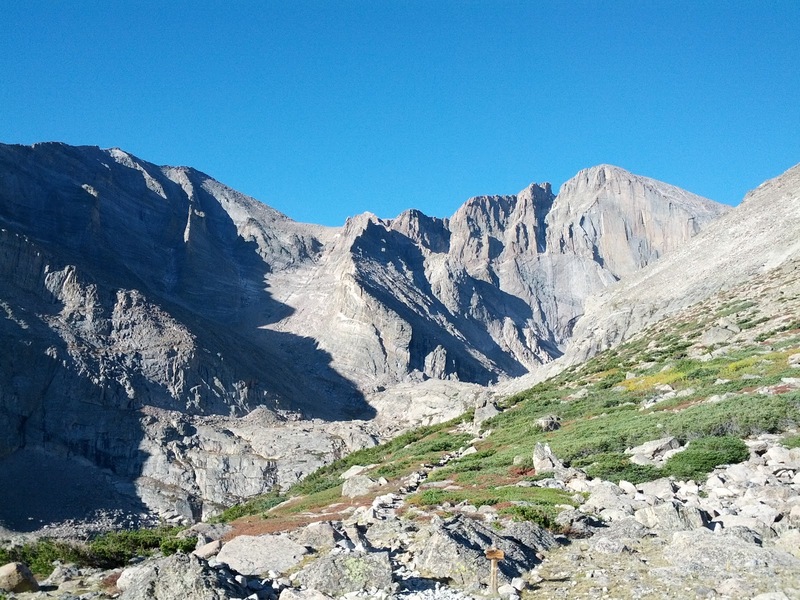 Most of the challenge of climbing Meeker lies in the gully above Chasm Lake up to the Loft. It's somewhat steep, requires the occasional 3rd-class move, and you have to know where to exit near the top to find the ramp and switchback to avoid a cliff. It's also the kind of place where you'd want a helmet, as we could hear the occasional ice and rock succumb to gravity. One climber we met coming down said he had a close call with a cinder-block size rock moving within feet of him at high speed, but fortunately Elizabeth and I avoided such danger. Now I wish I'd have stopped and taken more pictures along the route, but I think Elizabeth and I were justifiably concentrating on the routefinding and making it to the top safely. Once at the Loft, a climber's trail took us most of the way to the top. 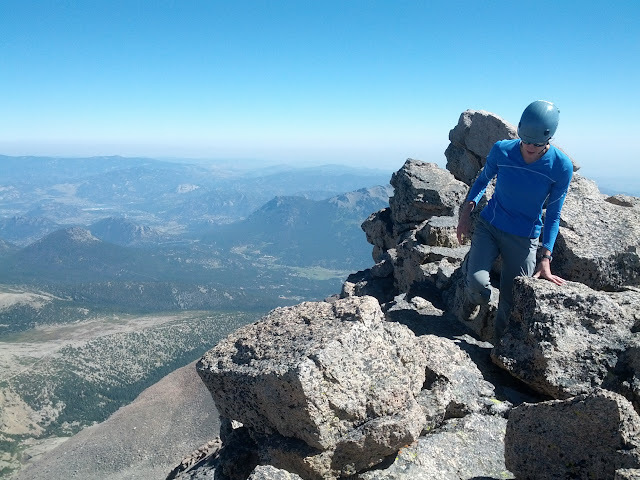 Meeker's summit is a pretty airy place along a narrow ridge. 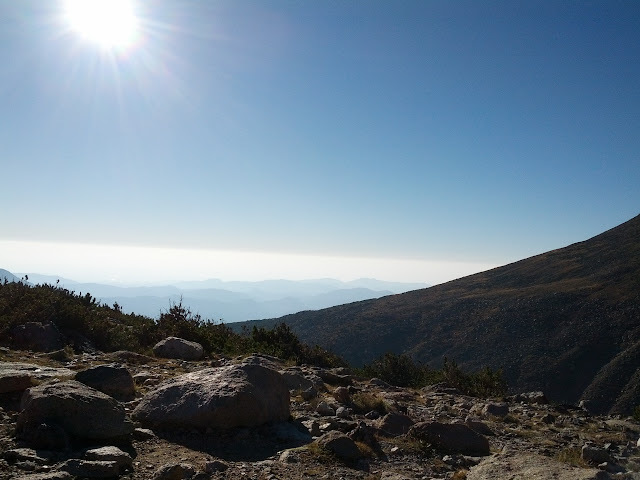 Elizabeth and I reached the summit ridge and moved cautiously towards the mountain's highest point. We took turns moving along the ridge while the other took pictures. The exposure really wasn't that bad, but certainly not a place to try anything foolish. Elizabeth leaves her pack behind and moves towards the summit block. 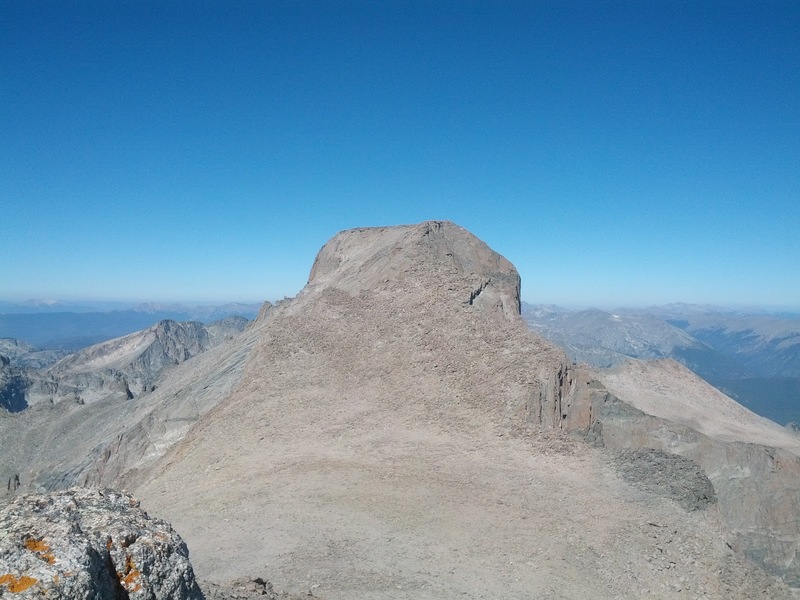 The more distant high point is the high point of Meeker Ridge, and a careful traverse (that we didn't attempt) separates it from Meeker's main summit. 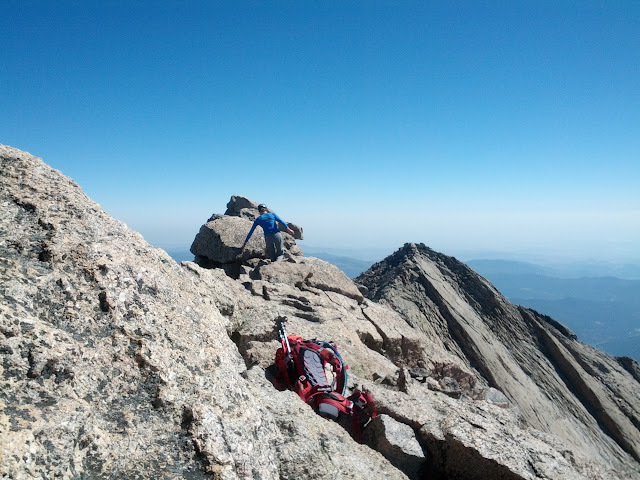 Meeker's summit block requires a 4th-class move, meaning if we fall we're probably going to get hurt. We explored the right side of the block where it slopes the lowest, but neither of us saw a graceful way of getting down once we got up there. Later, reading at home, I saw the suggestion that the crack on the left in this picture might be the surest way up. Climbing up the crack in the summit block would have worked, but the thought of stumbling when dropping back down was enough for me to decide that standing on the absolute highest point wasn't worth it. 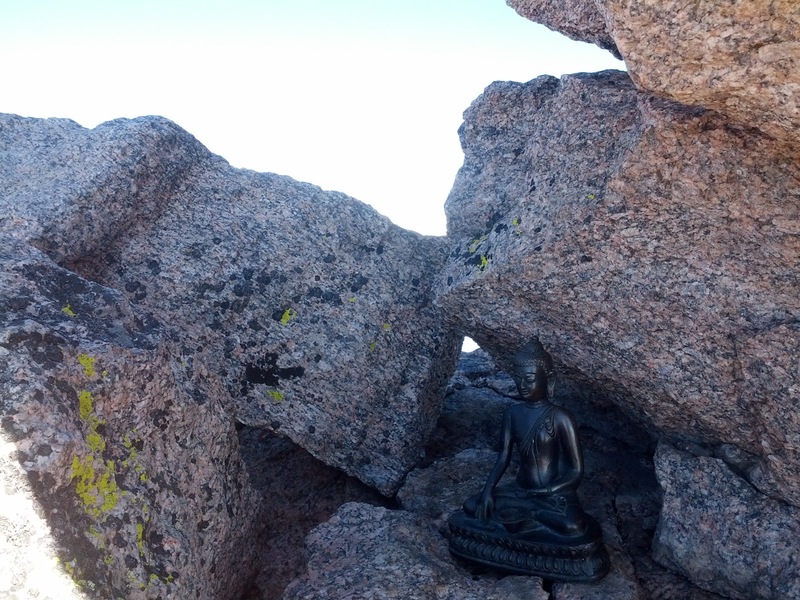 Compared to the 2.5 acres of almost flat ground on top of Longs Peak, Meeker is no place to celebrate with dozens of your newest friends. Thankfully, we had the upper mountain all to ourselves and didn't have to wander far from the ridge. 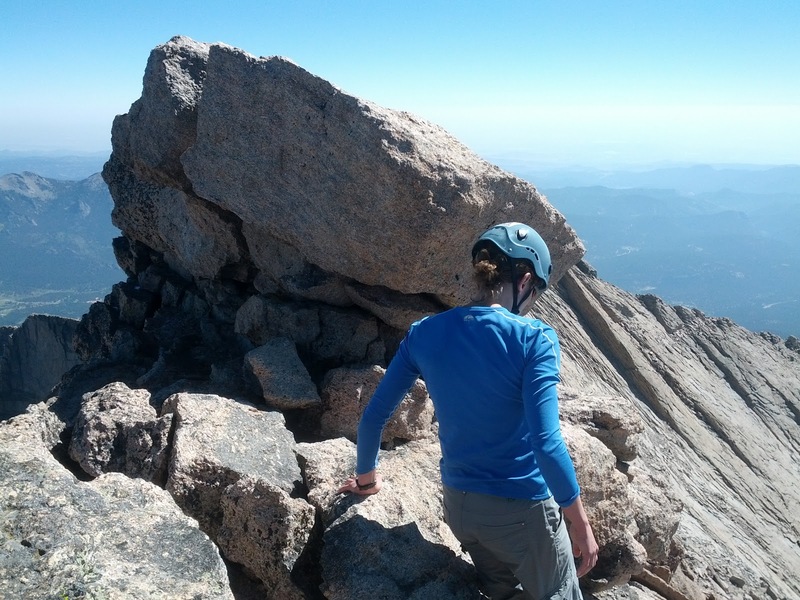 Meeker's summit is just airy enough that it's probably not a fun place to be when it's wet or icy. Elizabeth also opted to not try standing on the summit block, but she did exceed its height. Or her arm did, anyway. The canister for the summit register was empty and uncapped at one end. Usually that's about all I look for on the summit, but this place had someone to greet us at the top. Buddha looking fit and trim compared to other times I've seen him, not surprising given the effort it takes to climb Meeker. We took the customary 20-30 minutes to eat lunch before heading back down. There wasn't much to hurry us except for the knowing that getting to the top is only half the challenge. Looking to the east you can really get a sense for how tall Meeker stands above the Front Range. 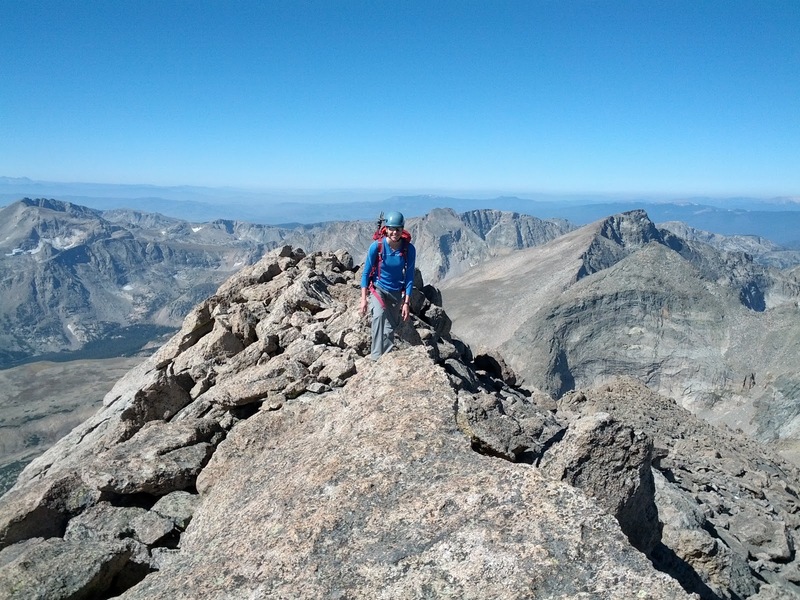 Meeker was Elizabeth's first 13er, even though she's climbed Longs nine times. 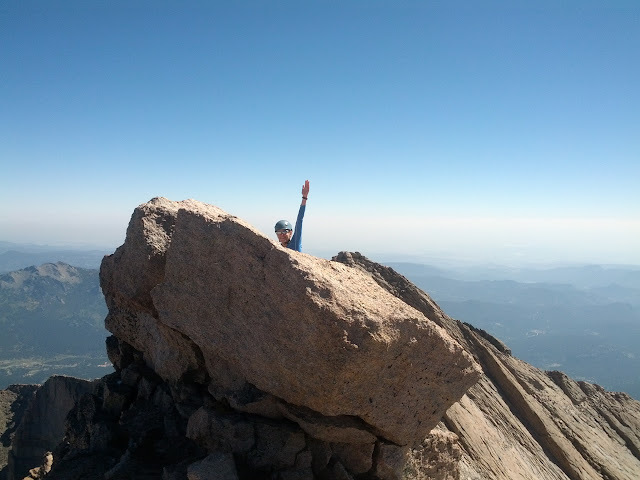 Apparently she's never read the book, "How Most People Get Started Climbing Colorado's Big Mountains." 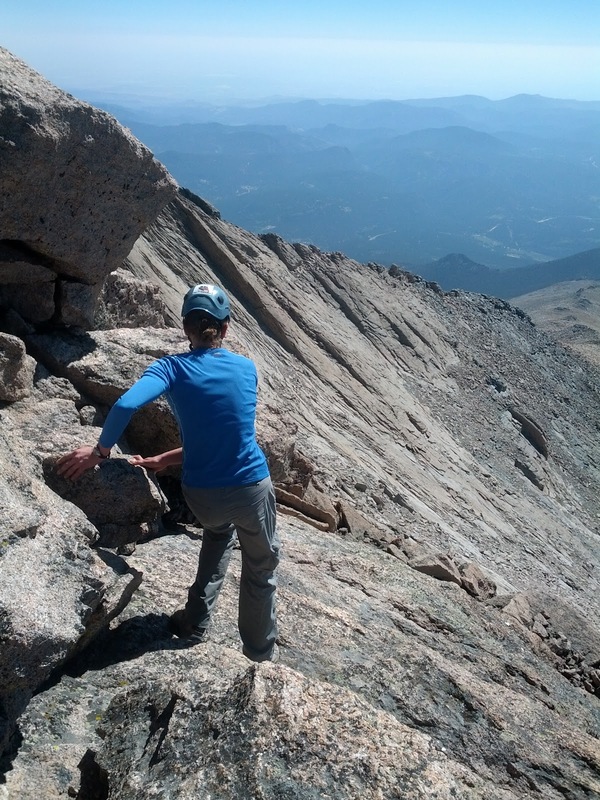 It was great to see her excitement and satisfaction of seeing Longs from the top of Meeker. Longs Peak is an incredible mountain, but frankly, compared to Meeker's narrow summit ridge, Longs looks like it's been broken off at the top. On the way down we detoured to Chasm Lake for the scenery and for me to refill my water. The mid-afternoon sunlight coming over Longs and dancing off the water was a great gift after a great climb. Chasm Lake is an awesome place and easily reachable for the reasonably fit. I need to go back there soon and often. We reached the car around 4:30, roughly 10 hours after we started. (On her own I bet Elizabeth could do this in 8 hours. Thanks for your patience, Elizabeth!) All my summer running and packing lighter than usual paid off -- I can't remember feeling better at the end of any climb like this one. (How I felt later that night and Sunday, however, was another story. Let's just say for about a 24-hour period I avoided any and all sudden or jarring movements.) The experience has left me wanting to climb something else before the snowflakes stick, although I get the feeling my school schedule might have something to say about another climb as big as this one.